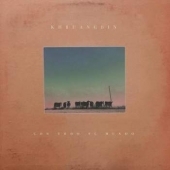 Since the release of ‘The Universe Smiles Upon You’, Khruangbin have spent the past two years playing non-stop worldwide. From a European tour with Father John Misty to supporting Maribou State at Koko, a string of festival dates at Glastonbury, SXSW, Dimensions, Gottwood, Love International, The Great Escape, The Downs with Massive Attack, a joint US tour with Chicano Batman and extended headline excursions; Songkick estimates Khruangbin played around 100 gigs in the past year. The band count it at a fair few more. As a nod to their travels, Laura and Mark have been presenting a weekly “AirKhruang” DJ set live each Friday on their Facebook page, where the pair play a selection of music by artists from a particular city.